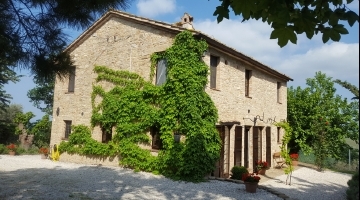 Property for sale in Cupramontana, Italy. Properties Cupramontana. Cupramontana is known as the 'Capital of Verdicchio', and was probably founded in the 5th to 4th century BC. The town took its name from a temple that stood there and was dedicated to the goddess Cupra. Mentioned by Pliny the Elder and Ptolemy among the ancient cities of Piceno, in the Augustan age, was an important Roman town. Devastated during the war Greek-Gothic, was abandoned, and its ruins were later used for the construction of a fortified place, and later castle, which was built very close in a higher place and which was given the name of Masaccio. From the seventh century was part of the Lombard Duchy of Spoleto. From sec. XIII was merged in the county of Jesi, becoming until its dissolution in 1808, the most important center of the county. In sec. XV was one of the strongholds of the heretical sect of the "Fraticelli", in 1444 it was occupied by troops of Francesco Sforza and in 1517 the looting by the militias of the Duke Francesco Maria della Rovere. There followed a long period of peace, during which experienced a strong population growth combined with a remarkable cultural development. In 1747 it was recognized, close to Masaccio, the site of the ancient Cupramontana: this was possible with the correct reading of an inscription discovered in 1718 in the archaeological zone. In 1798 the French troops who had invaded the Papal States plundered the country after the people had opposed a stubborn but futile resistance. In 1861 Vittorio Emanuele II granted Massaccio to regain its ancient name of Cupramontana. It is a 30 minute drive to Ancona Airport, or 50 minutes to Perugia Airport, 3 hours to either Bologna or Rome Airports. The train service to Rome and Ancona is found a 5 minute drive from the property, at Castelplanio-Cupramontana station.